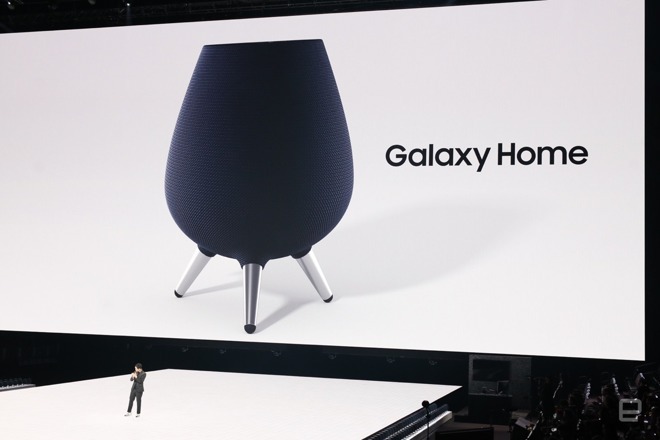 In addition to revealing the Galaxy Note9, one of Samsung's other product announcements on Thursday was the Galaxy Home, the company's first smartspeaker. The device is based on Samsung's Bixby voice assistant, and has eight far-field microphones. Speaker technology comes courtesy of Samsung's AKG, and the device will have a built-in SmartThings hub to connect smarthome accessories. Little else has been revealed so far, but a partnership with Spotify should make the latter's music easier to move between Samsung devices. An unusual design touch is that the base is supported by three metal legs — most smartspeakers, such as Apple's HomePod, sit directly on a surface. More details will be announced at a developers' conference in November. Samsung faces an uphill battle, given overwhelming control of the smartspeaker market by Amazon and Google. Even Apple's HomePod has just a 6 percent install base in the U.S., which may be why the company is rumored to be considering a cheaper version. Many Amazon and Google speaker owners also have multiple units, meaning they're unlikely to switch ecosystems.